Home » Cooking » Happy New Years! One of this first things you ought to know about me – if you didn’t know it already – is that I read. I research. I read and research obsessively! Once I get hooked on a topic I don’t give up until the topic is pretty thoroughly covered and committed to memory (what little memory is left – I would start taking notes, but then I forget where I put them…). This held true with computers when I first got involved (and although computers have since gone way beyond what abilities I learned back then, I can still hold my own), with spinning, with wood turning, and with broom making. And I don’t much read books anymore which is sad, I know, as we, as a family, probably have a library of 10,000 plus! I read and research on the internet… Got that? OK! Next, you need to know that I don’t really celebrate holidays. I mean, I do dress up and go over to my in-laws home and sit down to turkey dinner a couple times during the holiday season, and I did stay up to midnight on New Year’s Eve (but, then, I stay up to midnight most every night working on one project or another). This means I don’t make resolutions. But this year… Well, you know if you’ve been reading here or on my Facebook pages (personal https://www.facebook.com/shawn.hoefer, Business https://www.facebook.com/pages/Laffing-Horse-Designs/246008297832, Jeanette’s https://www.facebook.com/pages/Common-Threads/172741799435516) that I’ve had some health issues in the past couple years and I am really wanting to start feeling better. 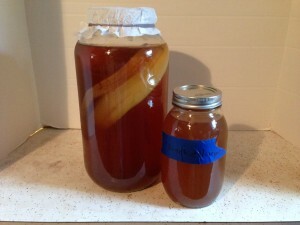 Kambucha in the brewing stage and a bottle of over-brewed Kambucha which can be used as vinegar in cooking. A double win! To that end I am going to start eating more fermented foods. Seems that everywhere I turn, I am reading reports – both the fluffy, new age kind of reports and the hard science kind of reports – say that eating fermented foods is good for digestion, good for joint health (and I don’t mean the kind you can now get in Colorado), and just all around chock full of vitamins and minerals. As I write this, Jeanette – who has been a fan of fermented foods, but hasn’t eaten them much as of late because the rest of the family tends to turn their noses at them (not entirely true, but that’s another story altogether) – is adding bits of commentary. I’m writing out loud, y’see… I’ve already started a batch of Kombucha Tea, and have the ingredients for sauerkraut and kimchi and beet kvass ready. I’ll let you know how these come out. Up next? Water kefir, more lacto-fermented (pickled) vegetables, home made tempeh, and old-world corned beef! What fermented foods do you like, or would you like to try? Let me know and even if you don’t ever make them yourself, maybe I can make them and you can live vicariously through me 🙂 P.S. I’ve also decided to take up another language – French – and I’m doing so using the great iOS app Duolingo! P.P.S. For geek cred, I can say that Kvass is a Klingon drink, right? Sure sounds like it! Maybe if I add an apostrophe… K’Vass!